Storyline: Peter wakes up one morning to see that had snowed overnight. Peter is a little boy. He puts on his snowsuit and runs outside to play. He makes footprints on the snow, he knocks the snow from the trees and watch it falling, he makes a snowman and a snow angel, climbs a hill and slides. He packs up a snowball and puts it in his packet, for letter. Then he gets back inside and tells his mother about his adventures. Just before bed he remembers the snowball in his pocket and checks on it. But the snowball had melted. Overnight, he dreams that sun had melted all the snow. When he wakes up, the next morning, the snow is still there, even bigger. If the story seems so simple is because this is just a pretext for introducing the first African-American child in a storybook, back in 1962. The significance of this book consists in the introduction of minorities in children books, unprecedented in the United States before “The Snowy Day”. Keats got his inspiration from a strip of pictures he had seen then more than twenty years earlier in Life magazine. 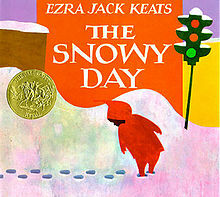 Illustration: Ezra Jack Keats is also the illustrator of this book. His style stands out through his blocky depiction of the story settings, through his bold but nuanced colors and through the ways his characters’ communicate us their feelings.